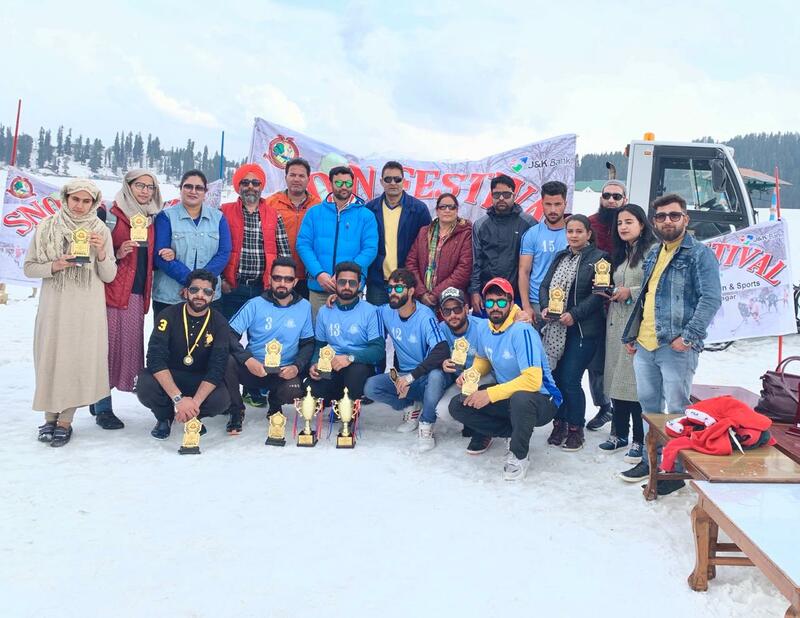 SRINAGAR: The two day Snow Festival organised by Directorate of Physical Education and Sports University of Kashmir concluded at Gulmarg in which as many as 12 colleges and students of Kashmir University participated. During the two day event competitions were held in snow football (men), cricket (men),Hockey(women)and volleyball (women). On the first day of the event competitions were held in football (men) and cricket (men). On the second day competitions were held in volleyball (women) and hockey (women). Islamia college won football (men)and cricket(men) competitions. Kashmir University were runners up in cricket and volleyball competitions. Women’s college MA road won Hockey (women) and volleyball (women) competitions. Physical Education College Ganderbal bagged runner up trophy in Hockey (women) and GDC Bemina clinched runners up trophy in football men. An impressive prize distribution ceremony was held after the culmination of events to felicitate the players. Dr. Nisar Ahmad Khan Coordinator Directorate of Physical Education and Sports University of Kashmir was the chief guest on the occasion. Speaking on the occasion Dr. Nisar Ahmad congratulated all the participants for taking part in the event. He thanked Vice-chancellor and Registrar of the University for their support in facilitating the directorate in organising the event. Dr. Nisar Ahmad also thanked Tourism Department, Chief executive officer Gulmarg development authority and management of J&K Bank for their support in making the event a grand success. He also had words of praise for Mr. Nadeem Ahmad Dar Assistant Director Physical Education and Sports and all coaches,sports assistant and other staff of the Directorate for organising the mega event successfully. Mr .Nasir Mahmood Assistant Director Tourism Gulmarg appreciated the efforts of Directorate of Physical Education and Sports University of Kashmir for organising this event with a special theme. Dr Altaf Ur Rehman Physical Director Islamia college presented vote of thanks on the occasion. Mr. Sajid Dar football coach of the Directorate conducted proceedings of the ceremony.